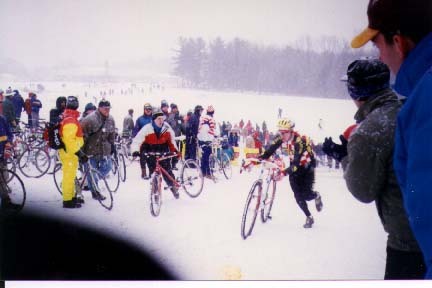 Cyclocross in New England - How we got to where we are today. This is my version of the story of how New England cyclocross evolved into what it is today. I have been amused by some of the postings on the yahoogroups necyclocross discussion group, and this is my response. I don't know much about New England 'Cross before 1986. Nationals were held in Plymouth MA in 1983 and were won by Steve Tilford. I assume that this was promoted by the old guard of the Mass Bay Road Club, including the Sykes, Adams, Mills, and Paul Curley. Perhaps someone can fill me in with the details. I suspect that this is the group that first brought 'cross to New England. Paul was the 1985 National Championships winner, a race held in Nutley NJ according to the listings in the back of the old USCF rulebooks. I first heard of cyclocross in 1986 when Buzz Tarlow of the Boston Road Club started a training series in Newton during that fall/winter. The series was mostly attended by a bunch of beginners, and nobody really knew too much about 'cross, but it was a chance to get out and train. Up to a dozen or so people would show up, mostly on mountain bikes. I met UCI Commisaire Bill Dolan here, as he used to bring his 14 year old son Billy to race. Billy had a real Guerciotti cross bike, the first that I had ever seen. One week this guy Tom Stevens showed up. Tom was a Cat 2 riding for the Richard Sachs team, and he was the first person to show up there who had "real" cross experience. 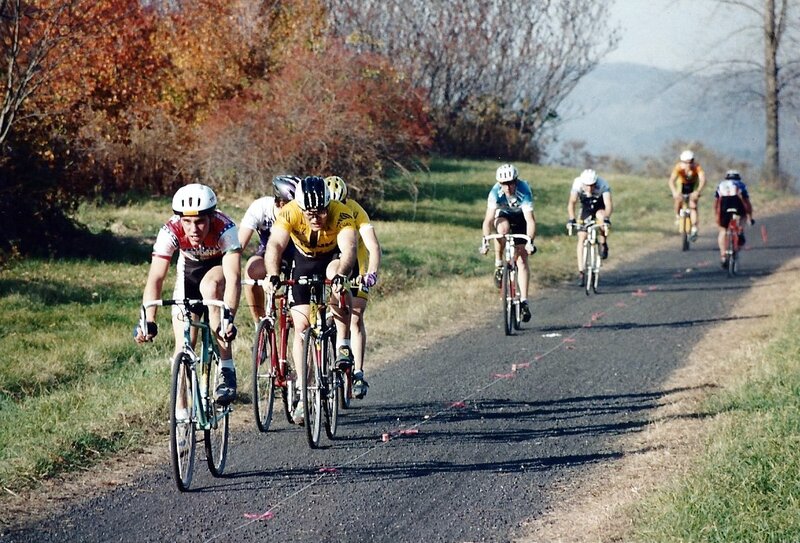 He helped get us all started, and came by most weeks that there was not a USCF cross race going on, which was quite often, as the calendar was not too full at that time. As far as I know, at that point there were races at Wompatuck, Mansfield Hollow, Putney, and Plymouth. I am not sure if there were others. 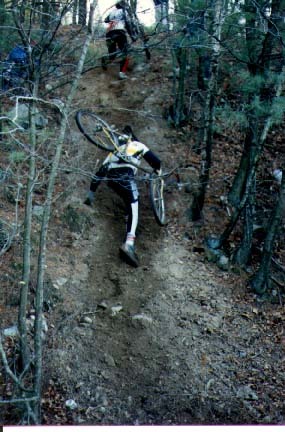 Between 1987 and 1990, 'cross started to grow. 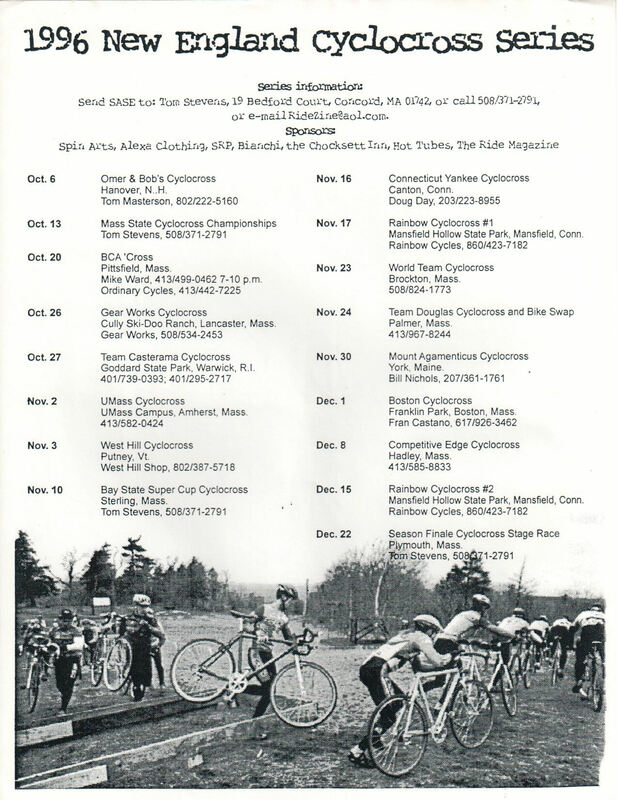 Other races that took place included Mt A in Maine, promoted by Bill Nichols, Palmer, promoted by various Cyclonauts, Pittsfield, and a cowfield race in Connecticut not far from Hartford. These races each took place multiple times. It was during this time that Jim Quinn and The Bicycle Link began supporting cross at Wompatuck. Kenny Gonsalves was working at the Link, and he and his brother Tom started up a second race at Wompatuck. Both of these guys were very competitive. 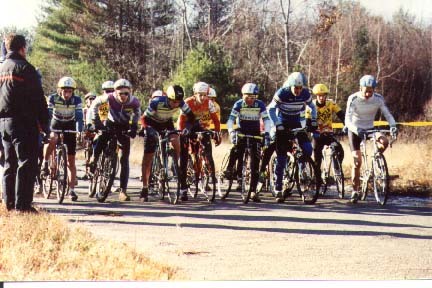 Other riders of the era included the McCormacks, Curley, Jason Snow, Jesse Bushnell, Tom Stevens, John Funk, Scott Wade, Mike Ward, Amos Brumble, Adam Myerson, and Tom Masterson. There were always two races a year in Plymouth, one at the high school, which still exists today, and the "stage race" at the intermediate school across the highway. This was traditionally the last race of the year, and we had a one lap TT, a grass crit (that changed every year), and a traditional cross race. I don't remember if this was an omnium, or on time, but I think it was time. Nationals also returned to the Plymouth High Course in 1988. Jan Wejak won the race amid some controversy over his citizenship and eligibilty for the championship. In subsequent years, Jan was one of the few who could challenge Frank and Mark. I think the pace was higher whenever he showed up, as I was far more likely to get lapped when he was in attendance. Mark McCormack won the Junior championship that year, and Lisa Mulhich won the women. At the local races, women, juniors and masters all competed together. Fields were very small, usually about 20 in the combined field, and the open mens races were about the same. Most races also had a "Citizens" category where local mountain bikers would give cross a try. Nationals returned to New England in 1991, with a race promoted by Paul Curley at the Walter Fernald State School campus off Waverly Oaks road. This brought 'cross "downtown" as the venue was a stone's throw from Belmont Wheelworks. The attention gathered by this well-promoted event was undoubtedly one of the catalysts for the explosive growth of cross that was to come. Paul won the Master's category at his own race over longtime rival Larry Malone. Kathi Riggert defeated Muhlich for the Women's title, and Don Myrah took the Open prize over Markie. Around this time Adam Myerson et al started promoting a race on the campus of UMass in Amherst. The first few years had some teething problems, but Adam soldiered on and sometime in the early 90's, this race really took off. This was the first local event to draw a crazy-large field, something like 200 total entries, which was unheard of at the time. I don't know if it was the location, good promotion, luck, or just Adam's charisma, but this was a watershed event in NE 'cross history. Between the successful Waltham Nationals and this, the potential for 'cross was clearly demonstrated, and I am sure this got a lot of people thinking about promoting races. Lyle Fulkerson and Tom Stevens take cross to a new level. Thousands descend on abandoned military base for the largest 'cross festival ever seen in this country. So, anybody still waiting for this to be continued? I was away from cross for a long time. Haven't really got back to it much. It's not grassroots anymore. Gloucester is the big deal. Lots of carbon. Now people train for cross instead of crossing to train. Progress, I guess. Please notify me of any problems that may arise with the site so I can try to fix them. Thanks!